As a professional organizer I often have the privilege of working with clients during exciting transitions in their lives. Joyce Zimberg hired AKorganizing just a couple of weeks after she had retired as an attorney. She was ready for a totally fresh start. She wanted to declutter in a really big way – closets, kitchen, files, desk, library – all of it. She also wanted to put systems in place to support her new business, Glasscoupage – she creates beautiful one of a kind glass decoupage pieces. Everyone has a preferred organizing system and for Joyce, drawers worked very well. I’m going to share with you the specific products we used to “containerize” two very important yet different elements in Joyce’s home, travel products and art images and supplies. Joyce lives right near Bloomingdales AND is an avid traveler so she had a huge collection of travel and sample sized products that needed “containerizing”. We used Clear Shirt and Accessory Drawers from the Container Store to store the travel products. 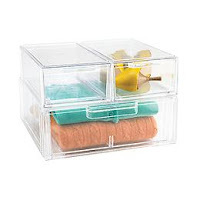 The drawers come with dividers which made them perfect for travel and sample size cosmetics and skin care products. Using a label maker we labeled each of the dividers in the drawer and organized them based on frequency of use. Now, grabbing the right moisturizer, cleanser or shampoo for her travel kit is a breeze. Moving to her studio area, we applied the same drawer concept to organize paints, brushes and art supplies. With clearly labeled containers, she’ll never have to shuffle through every color of the rainbow to find the perfect red. 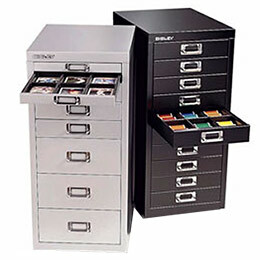 Similarly, we used a Bisley Collection Cabinet to sort and keep images organized. With clearly labeled drawers, finding the right image is a snap. Now when she is creating a piece on an Indian goddess she won’t need to sift through cherubs, tigers and flowers to find it. Joyce was thrilled. Do you have a favorite organizing system? Leave a comment below and let us know.